Who has access to your Dynamics SL data? 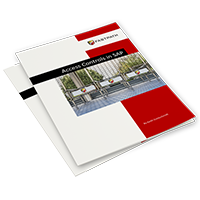 The Fastpath Assure Access Review module lets you review and sign-off on user access in Dynamics SL to maintain a secure environment. Do you know who has access to your SL system? It's a necessary process to regularly review the access levels of your users, especially in sensitive areas like company financials. But running these reports tends to be extremely time-consuming. 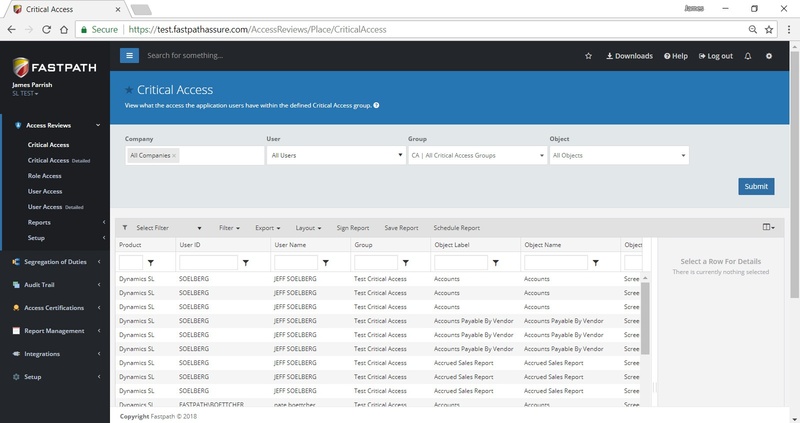 With the Access Review module, businesses can solve this issue by automating this process. The reports can be scheduled, and review sign-offs can be recorded for future audits. Assure comes out-of-the-box with Access Review templates, so you can run reports like critical access reviews, immediately upon installation. When your SL auditors have questions, Fastpath Assure has your answers. Can You Find the Risks Existing in SL Access? 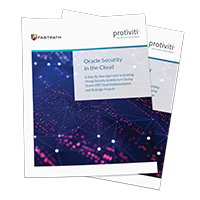 The Fastpath Assure segregation of duties (SOD) SOD module pulls user access in SL, reporting conflicts for mitigation and security maintenance. The security of your business systems can come down to who has which permissions in Dynamics SL. To review this, it's important to have a well-designed SoD ruleset in place to make sure you know which users have conflicts in their access. For instance, you may want to know if a user can create vendors and pay those vendors. That knowledge would allow you to add controls to prevent the user from creating and paying fake vendors. 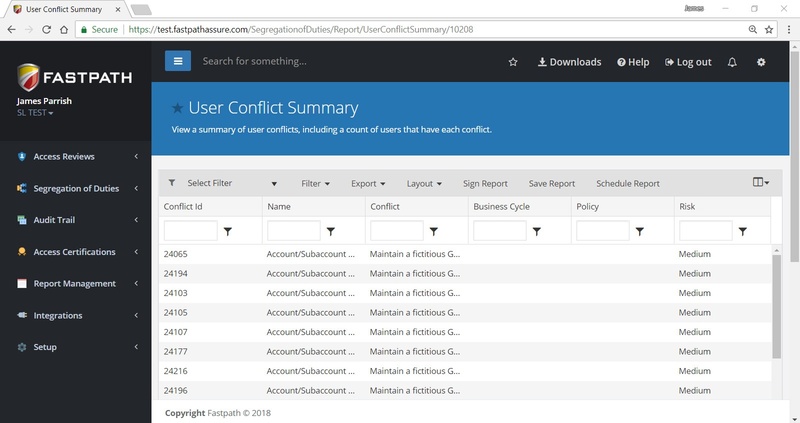 With the SoD module, you can automate the review of these conflicts in SL and record any controls you use to mitigate existing conflicts. Assure does this with an out-of-the-box SoD ruleset, built by certified internal auditors specifically for Microsoft Dynamics SL. 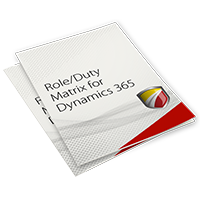 Segregation of duties ruleset designed for Microsoft Dynamics SL. Includes an extensive list of potential conflicts specifically for Dynamics SL. Security reporting by user, form, or window. 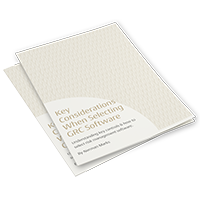 Repeatable automation provides continuous compliance. Best-in-class performance and reporting for Microsoft Dynamics. Intuitive and automated system supports continuous compliance. Define custom report schedules (daily, weekly, monthly). 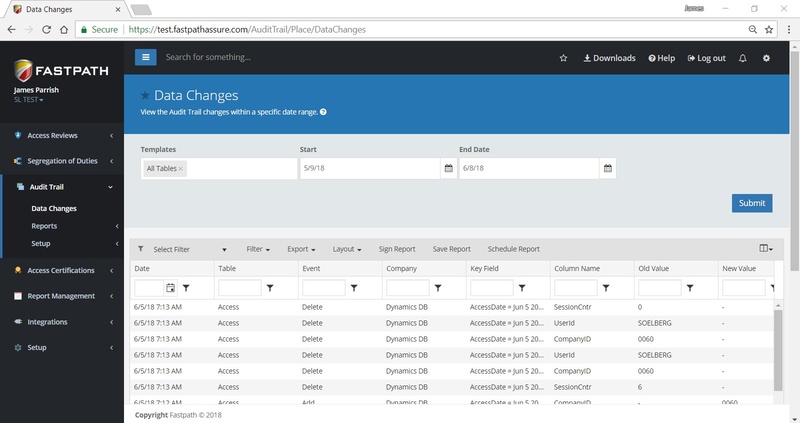 In Fastpath Assure the Audit Trail module tracks changes in Dynamics SL, reporting when and by whom, including the before and after values. Tracking the changes in a Dynamics SL environment can be the only way to find errors, fraud or misstatements. The challenge arises in that there is not a native SL audit tool to track changes. To solve this problem, Fastpath Assure offers an Audit Trail module with the ability to track all changes to SL, as well as those made to any other Microsoft SQL based application. The tool can record what was changed, when, by whom, and most importantly, the before and after values. Track changes made from inside Dynamics SL and external sources. Track before/after values including items that have been deleted. Standard audit trails make implementation quick for immediate ROI. Monitor Microsoft SQL server schema changes. Best available performance and reporting. Automate change reports (daily, weekly, monthly).